A very good news now coming for Urdu Teacher in uttar pradesh who are waiting for government Teaching Job for Urdu teacher posts in government primary school of basic shiksha parishad BSP . 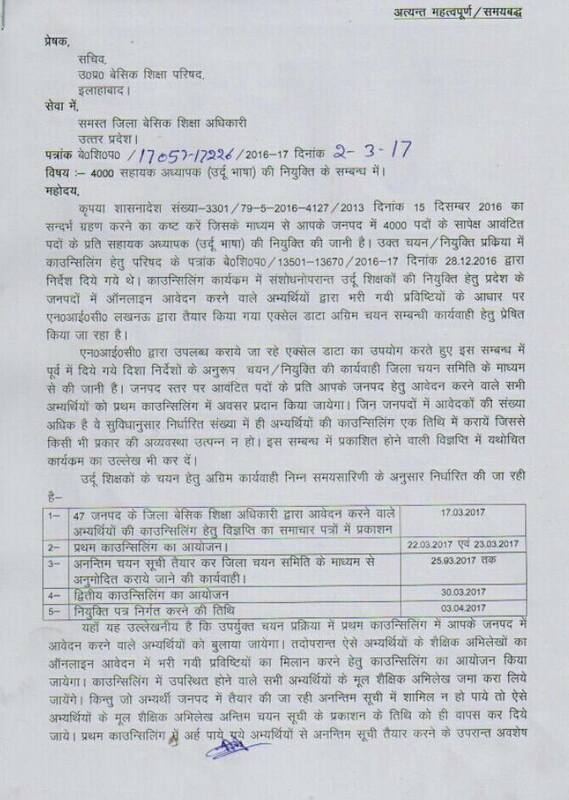 state government of uttar pradesh will publish official recruitment notification for 4000 posts of Urdu Teacher of Parishadiya vidyalaya of UP. Total 4000 posts of Primary school teacher have been reserved for Urdu Teacher. Government has issued Government Order GO regarding Urdu Shiksha bharti 2018. recruitment process has been started from this month. recently government approved posts of assistant teacher in 9974 government primary school . after that Urdu teacher demanded to reserved to posts Urdu Teacher in these posts. 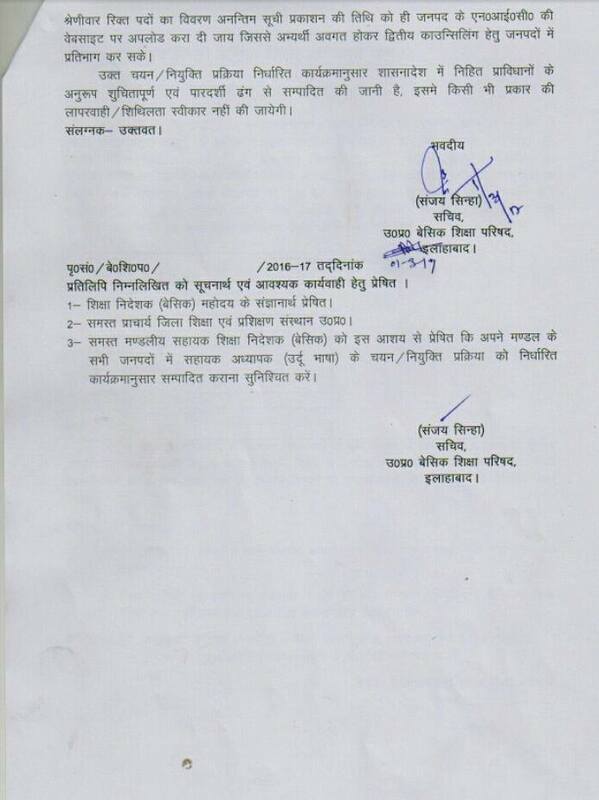 After that Sachiv of basic shiksha parishad send the proposal to state government of Up . Now government taken decision on the matter and total 2000 posts will be reserved for Urdu Teacher. According to Shasanadesh published by sectary of basic education department , total 2000 posts are reserved for 3500 Urdu teacher and 19948 posts for Assistant Teacher for primary school. Only those teachers who are TET qualified and have Moallim E Urdu Certificate of Two year Urdu BTC course. Government issue district wise posts details of Urdu Teachers. Education qualification : Those candidates who have moallim E urdu degree / diploma in teaching from Aligarh Muslim university, Graduation in Urdu or post graduation and basic Teacher certificate or BTC Urdu . Selection Procedure : selection of the eligible candidates will be based on through the academic merit . after filling online application form , education department will prepared district wise merit list and publish it District wise . after that candidates are required to appear in counseling for document verification . all document will be deposited at the time of document verification. Merit list will be prepared on the basic of marks obtained by the candidates in high School, intermediate, and graduation marks percentage. Training: theory Practical 12 marks each for 1st division, 6 marks for 2nd division each,3 marks for 3rd division each. A merit will be prepared on the basis of gunvatta ank / formula mention above. Only those candidates who are living in uttar pradesh since 5 years can fill application form. After the selection procedure these urdu teachers will be appointed in those school where student of Urdu language will be available. Application form submission process will be completed in four phases . First of all candidates are required to fill registration form. After completing the registration process pay application form fee via e challan form or net banking on next working day. After paying application form fee, just revisit online and complete the registration process and take a printout of your application form. Application Form Fee: for general and OBC candidates application form fee will be rs 500, for SC ST application form fee will be rs 200. Candidates can deposit form fee via bank Challan. Appointment / Joining for selected candidate: after 2 days from verification and Medical. News Updated of Up Urdu Teacher Vacancy 2018-19 will be updated here. 1996 बैच वालों की तिथि को लेकर समस्या उत्पन्न हुई है... जोमिया उर्दू अलीगढ़ ने फ़रवरी 1997 में परीक्षा संपन्न कराई 28 जुलाई 1997 को राज्य के विभिन्न समाचारपत्रों में परीक्षा फल प्रकाशित हुई, जबकि 11 अगस्त 1997 तक परीक्षा फल पाचुके अभ्यार्थियों को लिया जा रहा है. डाक के जरिए घप भेजी गई मार्कशीट में 25 सिम्बर 1997 लिखा है इसी को आधार बनाकर उ.प्र. के कई सेंटरों पर बे. शि. अधिकारी कार्यालय से अम्मीदवारों कोफोन पर सूचित किया गया कि वब अपले मूल अघिलेख आकर ले जोएं यानि उनका सलेक्शन नहीं हुआ. दूर से आए अम्मीदवारों को एस एक फोन से बहुत कछिनाई का सामना करना पड़ा. अब लोग जामिया उर्दू अलीगड़ जाकर जिक्लेयरेशन लेटर बनवा रहे हैं. इस सारी प्रक्रिया में परेशामी बोरोज़गार लोगों को हो रही है. अधिकारियों के एक फैसले से. अगर जानिया उर्दू अलीगढ़ से उ. प्र. सरकार पूरी सूची मांग लेती उन उम्मीदवारों की जो 1996 बैच के हैं और परस्पर सहमति से तिथि को सेकर भी स्पष्टीकरण हो जाता तो प्रशासनिक स्तर पर ये तरीका सराहनीय होता. अभी जो कन्फयूज़न है वो भी स्पय़्ट हो जाए तो उचित होगा. धन्यवाद. kash sarkar jaise election k start hone se pahle public k touch me rahti hai usi tarha agar baqi k time me bhi touch me rahe to shayed hame koi pareshani na ho. q k naukri wagaira time to time hi dekhne ko milti hai. aur ab to condition itni dal di hai k jo education ke touch me nahi hai aur matured brain ho gaya hai wo waise bhi kuchh job k bare me nahi soch sakta. so pls try to solve problem to those who are indeed needy to job. i hope consider me positively. thank you very much.